Love Frozen? Watch The Story of Frozen: Making A Disney Animated Classic! 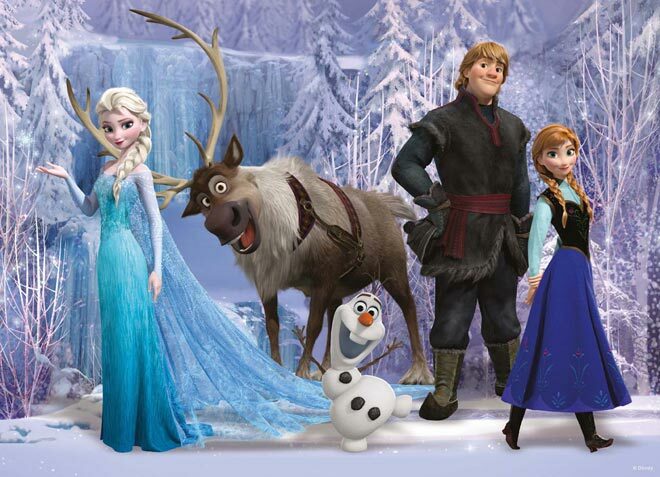 On Tuesday, September 2nd (8/7C), ABC is presenting The Story of Frozen: Making A Disney Animated Classic. The one-hour special is hosted by Josh Gad, the voice of Olaf the Snowman, and will feature interviews cast members and the filmmaking team. It will also feature a sneak peek at Disney’s next animated feature, Big Hero 6. For details, follow the jump. “The Story of Frozen: Making a Disney Animated Classic” is an all-new, original special in a first-of-its-kind collaboration with Lincoln Square Productions and Walt Disney Animation Studios. The special ventures behind-the-scenes for an exclusive look at the origins and evolution of the Academy Award®-winning film “Frozen,” now the biggest animated feature of all time. A breathtaking and fantastic saga, the special tells the real story of making a modern movie based on a timeless tale that nearly overnight became a cultural touchstone for legions of fans. “The Story of Frozen: Making a Disney Animated Classic” airs TUESDAY, SEPTEMBER 2 (8:00-9:00 p.m., ET) on the ABC Television Network. Viewers will get a rare look inside Walt Disney Animation Studios and unprecedented access to the creative team that brought “Frozen” to life. Throughout the one-hour special, the audience will hear from “Frozen” stars Kristen Bell and Idina Menzel, the directors, songwriters, producer, artists and chief creative officer John Lasseter—the team who dreamed of making a cherished Hans Christian Andersen story into a big-screen animated musical. Viewers will take a journey to the beautiful Norwegian villages and landscapes that inspired the look of the fictional kingdom of Arendelle and see images and footage from the research trips to Norway, Quebec and points beyond that helped create the film’s unforgettable look and feel. The program will culminate in an exclusive sneak peek at the action-packed comedy-adventure “Big Hero 6,” currently in production at Walt Disney Animation Studios –under wraps until now – as the team prepares their next big-screen epic. “The Story of Frozen: Making a Disney Animated Classic” is hosted by star Josh Gad (voice of Olaf) and features interviews with “Frozen” stars Kristen Bell (voice of Anna) and Idina Menzel (voice of Elsa) as well as Walt Disney Animation Studios’ chief creative officer and “Frozen” executive producer John Lasseter, Academy Award®-winning filmmakers, including directors Chris Buck and Jennifer Lee, producer Peter Del Vecho, and songwriters Robert Lopez and Kristen Anderson-Lopez. This one-hour special will also feature exclusive insights and commentary from art director Mike Giaimo and talented artists from the art direction, animation and effects teams. The exclusive sneak peek of “Big Hero 6” is presented by the film’s directors, Don Hall and Chris Williams. Walt Disney Animation Studios, the studio behind “Tangled” and “Wreck-It Ralph,” presents “Frozen,” a stunning big-screen comedy adventure. Fearless optimist Anna (voice of Kristen Bell) sets off on an epic journey—teaming up with rugged mountain man Kristoff (voice of Jonathan Groff) and his loyal reindeer Sven—to find her sister Elsa (voice of Idina Menzel), whose icy powers have trapped the kingdom of Arendelle in eternal winter. Encountering Everest-like conditions, mystical trolls and a hilarious snowman named Olaf (voice of Josh Gad), Anna and Kristoff battle the elements in a race to save the kingdom. The film is directed by Chris Buck (“Tarzan,” “Surf’s Up”) and Jennifer Lee (screenwriter, “Wreck-It Ralph”), who also wrote the screenplay. It is produced by Peter Del Vecho (“Winnie the Pooh,” “The Princess and the Frog”). Featuring original songs from Kristen Anderson-Lopez (“In Transit,” “Winnie the Pooh”) and Tony® winner Robert Lopez (“The Book of Mormon,” “Avenue Q”), and an original score by Christophe Beck (“The Muppets,” Oscar®-winning short “Paperman”), “Frozen” won two Academy Awards® (best animated film and best original song with “Let It Go”) and a Golden Globe® (best animated feature film). It is the fifth highest grossing film of all time and the highest grossing animated film earning more than $1.27 billion globally. Released wide domestically on Nov. 27, 2013, “Frozen” posted the No. 1 industry all-time Thanksgiving debut and Walt Disney Animation Studios’ biggest opening ever. The film’s Feb. 25 digital debut was the biggest digital release (sell-through) ever; its Blu-ray/DVD release on March 18 was No. 1 on the Nielsen overall disc charts for eight nonconsecutive weeks. The “Frozen” soundtrack is the top-selling album of 2014 and spent 31 consecutive weeks in the top 5 on the Billboard 200 chart, including 13 nonconsecutive weeks at No. 1. It is certified triple Platinum, selling more than 3.2 million units. The “Let It Go” film clip from “Frozen” has been viewed nearly 300 million times on YouTube. Lincoln Square Productions produces original content for broadcast, cable and digital distribution specializing in entertaining ways to tell fact based stories. Clients include ABC Television Group, Scripps Networks, Viacom, Discovery Communications, National Geographic Networks, and more. Lincoln Square Productions is a wholly owned subsidiary of American Broadcasting Companies, Inc. The headquarters are located in New York City.